1. Use honey as a natural wound treatment. Apply honey to a wound and take advantage of it's natural antibiotic properties. Wounds Search reports that honey has been used as a treatment for thousands of years and works because both the physical properties (gooey and sticky) and biological properties (acidity and osmolarity) work together. In short: try swiping some honey on that scraped knee instead of store-bought cream for a natural healer. 2. A spoonful of raw honey before bed may help you sleep. If you are struggling to get enough sleep at night, try eating a spoonful of raw honey. According to Medical Daily, "honey can cause a rise in insulin and release serotonin ... "The body converts serotonin into melatonin, a chemical compound that regulates the length and the quality of sleep.” Noshing on a bit of honey before you hit the sack will help your body produce natural sleep aids so you get better sleep at night. 3. Rehydrate yourself with a honey and citruses based electrolyte drink. Add honey to a natural electrolyte drink to reap the energy-boosting benefits in the natural sweetener. Try this recipe from Mother Nature Network: Combine 1/2 cup orange juice, 1/2 cup lemon juice, 2 cups filtered water, 2 to 4 tablespoons of honey and 1/8 teaspoon of unrefined salt in a blender and mix until honey is completely combined. 4. Honey may be used as an anti-fungal. Not only is honey a great way to treat wounds, because of its natural antibacterial properties, you can also use it to treat nasal infections and fungal infections (like athletes foot), according to Aniwell. 5. Honey may alleviate seasonal allergy symptoms. If you suffer from seasonal allergies, step away from the medication and grab honey instead. Medical Daily reports that honey contains anti-inflammatory properties which can help ease the swelling of sinuses. Not only that, honey could act like a natural vaccine, making you less susceptible to allergies in the future. 6. Honey may help to treat gum disease. Apply honey to infected gum area to help treat gum disease. Aniwell reports that while honey contains antibacterial properties, it is most effective when applied directly to the infected area, before the infection has time to get into the blood stream. 7. Honey may help to treat colds and sore throat. It's practically common knowledge that honey can help ease a sore throat. The soothing texture coats the throat and makes it easier to swallow. But, honey can actually help treat your cold too! 8. 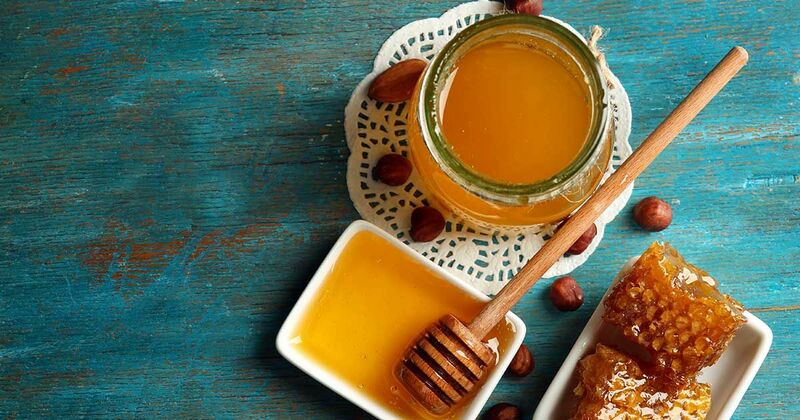 Honey for cancer treatment. This one is a bit harder to pin down, but some researchers believe that honey could help aid in cancer treatment. The theory is that certain honey contains an "extra" ingredient, that could help target more serious diseases, according to BBC. Snopes reports that while honey contains antiseptic properties there isn't enough research done to prove whether honey could help aid in the treatment of cancer. 9. Honey can improve the health of your skin and scalp. Mix a little honey with some warm water and apply it to itchy skin and scalp. Mercola reports that this treatment was shown to significantly reduce itchiness and scaling of skin. 10. Honey can soothe sunburns. If you have a minor sunburn or catch your finger on the cookie pan, you may be able to use honey to ease the pain. Dr. Andrew Weil recommends using a medicinal honey for burn treatments as your garden variety honey may not have enough antiseptic properties to property take care of the wound. 11. Honey may soothe ulcers and gastrointestinal disorders. If you have tummy troubles like an ulcer or digestive problems, ingesting honey may help. Raw honey contains probiotics which help your digestive system reset itself (restoring proper acid balance), according to Green Med info. 12. Honey may help to treat herpes. The anti-fungal properties in honey that help heal sores can also help with herpes (cold sores). Manuka honey in particular, has been linked to fighting more than 250 types of bacteria, according to Mercola. 13. Honey boosts your energy and immunity system. Some researchers believe that honey can help boost your immune system by introducing you to different bacteria. This bacteria encourages your body to produce more saliva and secretion, triggering your immune system more often, Green med reported. Do you use honey as a natural remedy? Tell us your favorite use for honey in the comments below. This mixture may sound a little bit weird, but people who have tried it swear by it! Not only does extra-virgin olive oil have a delicious, distinctive taste, but its properties are much more powerful than you would imagine. All it takes is one spoonful every night. Blood clots can form in a variety of ways, and it's important to know about them.